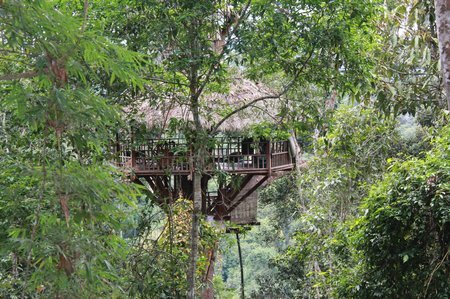 A review of the Gibbon Experience Laos including why we chose the Gibbon Experience, what it is and our highlights of the Gibbon Experience. Now that I’ve got the story about almost losing my child in the jungle off my chest, I can share the real fun of our time at the Gibbon Experience with you. 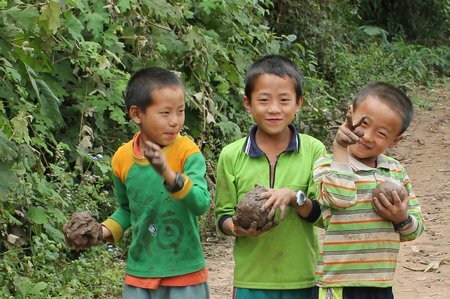 This entry was posted in International Escapades, Laos and tagged Gibbon Experience, Laos, Laos With Kids on February 14, 2011 by wandermom. It was just before Noon when we arrived at our Treehouse. I think it’s fair to say that all the adults in our group were relieved and excited at what we found. Reports of inadequate accommodation, bad food and vermin were quickly forgotten as we oohed and aahed at the scenery from our new home in the trees. It was definitely worth the steep trek uphill through the jungle from the nearest village and our first four zip-line experiences – even if BigB had been too scared to try all but the last on his own. The staff from the nearest kitchen zipped across carrying our lunch. There was hot chocolate for the kids and tea and coffee for the adults. It seemed as if we’d found backcountry heaven in a remote corner of Northern Laos. After lunch I decided to grab some quiet time while the rest of the group (two couples, Murph and our two boys) left with our guides to explore the trail system and do some more zip-lining. I meant to read but the forest sounds lullabied me into a short, deep sleep. I woke with a start not quite sure where I was. I was just getting my bearings when Murph re-appeared on the other end of the closest zip-line asking if BigB was with me. “No”, I called back. “I haven’t seen him since you left”. And Murph was gone. I sat back with my book. It was most likely a case of one of our children lagging too far behind or going too far ahead on a trail. I was sure they could figure it out without my help. Although, something kept me pacing around every so often just to see if anyone was coming. Murph was back. There was urgency in his voice as he asked again whether or not BigB was with me. Standing on the platform about 50ft away, he explained that the boys had been zip-lining together when BigB had decided that he was done – about 40 minutes earlier. No-one had seen him since. “Should I come help look?” I asked. And then my husband was gone again, off racing around the unmarked trail system and across vertiginous zip-lines looking for our ten-year-old son. Alone in the treehouse I had no clue what was going on in the search. I felt useless. Images of my baby wandering lost in the dense forest around me, or worse lying broken having fallen from a zip-line invaded my mind. With all my self-control, I wrestled the panic monster behind these thoughts and fought to keep myself calm. Time ticked by and I could hear BigB’s name being called out through the trees. I ached to hear an answering call. CAM returned. Either nervous that he was going to be held responsible for losing his brother or just too worried to talk himself, he disappeared into the tiny Crow’s Nest. Dusk was falling. Flocks of birds rustled in the trees, finding and settling on a perch for the night. The two girls from the kitchen came back with dinner, giggling and laughing. I don’t know if they even knew what was happening. The two other couples, who were our companions in the treehouse, returned. There were hugs from the women but I think they found my icy calm disconcerting. They sat around the table, no-one touching the food, conversing intermittently in whispers. I felt dreadful. Full of dread and guilty. They should eat, really. I knew they were probably hungry. But my suggestions to eat were brushed away. At least they were able to tell me that all the treehouses (there are six) had been alerted about the missing child and that all the guides were involved in the search. That gave some hope. It wasn’t quite dark yet, maybe BigB would be found soon. The part of my brain that knows about managing and resolving crisis situations (if only in IT terms) started working on scenarios: if he wasn’t found this evening; the size and scope of a search which we’d have to start at first light; injury; death. I had to shake myself back to calm. There was still hope. It was dark when Murph came back to the treehouse. He could barely move from exhaustion. There was no need for words, BigB had now been missing for over three hours. We held hands and hoped. Marco, one of our treehouse-mates took Murph’s place on the search. Time ticked by and the darkness deepened. We held on and held steady but every once in a while the clasp tightened to a frantic clutch as we rode personal waves of imagined horror at the loss of our beautiful, affectionate, loving, funny child. An hour later it was too dark to see but we heard the whirr of the zip-line. Marco’s face appeared at the landing platform, solemn. I gasped. No child. Really, this couldn’t be happening. I could feel my child in my arms but they were empty. My belly felt his small body nestle against me like he often did as a toddler but instead there was nothing. I would have collapsed into a mass of tears and panic if my husband hadn’t been holding on to me. We were holding each other up. We thanked the guides for their efforts. Someone offered them food which they ate hungrily. Murph and I watched. Food is such a practical thing. Someone suggested that the search begin again at first light. More practicalities. I think I might have been shaking. It had been almost five hours since anyone had seen BigB. And then there was a holler from the forest. Hoots. Cheers. We had no idea who was calling. Our guides, Tja Lee and Pa Lao had gone to the village about an hour earlier. It was too soon for them to be back. The zip-line whirred again and I saw a strange face coming across. The “OK” call was shouted and the next person clipped on at the other side. My baby, red-faced and sweaty, dirty and tired, but here. A long, tight, Family Hug. The explanation was simple: he’d taken a wrong turn on his way back to the treehouse and once he knew he was lost, felt obliged to stick to the path which had led him back to the village. The people who had brought him back to us were guides on their day off, who had been resting at the village. Our treehouse-mates took on the necessary job of hosting and thanking these new guides, leaving us to hug our child closely in a quiet corner. “I thought you’d chew me out.” he said. “It’s just not fair. You got wine and massages and all I got was lost”. 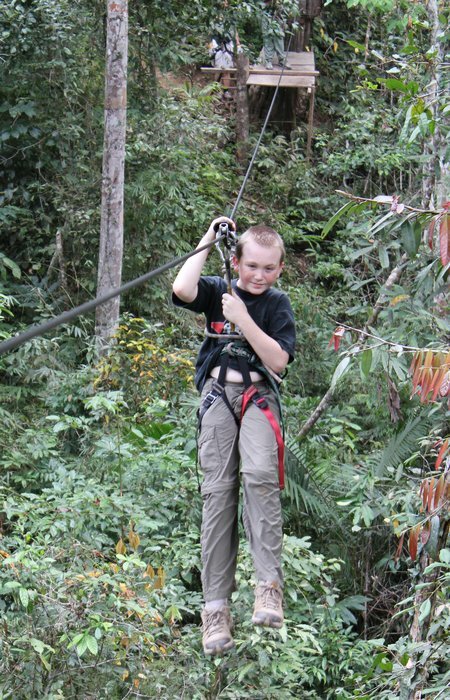 This entry was posted in International Escapades, Laos and tagged Gibbon Experience, Laos, Laos With Kids on February 9, 2011 by wandermom. We arrived at Golden Triangle, Thailand late in the afternoon. It had taken almost the whole day on a minibus and then a public bus to get from Chiang Mai to Chiang Rai to Chiang Saen and then on to Sop Ruak, a hamlet outside of Chiang Saen. At this stage even I was begining to wonder whether it had been worth the effort to get ourselves to this point on the map, where the borders of Thailand, Laos and Burma meet. Distracted by the glinting edificies and elephants, we snapped some photos and trudged along looking for our hotel, which turned out to be about 2km outside of the village. When they didn’t have any record of our reservation things careened on a downhill trend pretty quickly – until we realized that not having a reservation didn’t equate to there not being any rooms available and the bunglow that was being offered had two bedrooms and was cheaper than the rate we’d found online anyway. Done deal. We stretched out in comfort, pretty sure that we were the only guests at the Greater Mekong Lodge that night. This is Reason Number One for being in an empty hotel in a remote corner of Northern Thailand: the view. The trees at the front of this photo are in Thailand. 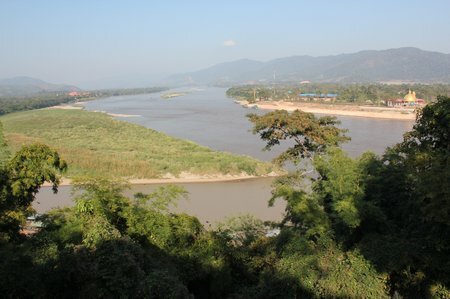 The triangular shape jutting into the river on the left of the photo is Burma and the land with the golden-roofed building on the upper right of the picture is Laos. I admit, it’s a little extreme to go so far off the well-worn tourist path to take a photo but geeky that we are, there was general agreement among the Murphy/Duffy family that this is a pretty cool snap to have in our trip collection. The Hall Of Opium museum was Reason Number Two (and actually, the primary reason) we were here. I’d read a short write-up about this museum in our guidebook and decided that it warranted a visit. I think I thought it would be fun and interesting but I didn’t expect us to spend four hours at the museum – without a single prompt or re-direct from parent to child – and I certainly didn’t expect the hours of discussion about drugs use which followed. In terms of a travel-educational experience, I think we hit the jackpot on this one. Unfortunately, the museum does not allow photographs to be taken of the exhibits so I’ll try to describe briefly what we saw and the impact it had, particularly on our boys. (This write up of the drug trade in Asia is a narrative version of most of the material covered in the museum). As the museum’s website says, the target audience of the Hall of Opium is teens and young adults, those most susceptible to the lure of illegal drugs, to show them how opium addiction became a world-wide problem, and how drug abuse affects individuals, their families, neighborhoods, and even their country. The edutainment factor is high, with plenty of multimedia displays and buttons to push for recorded explanations. All the information was available in Thai and English with some Chinese in the section on the Opium Wars. There is a small display showing all types of the poppy (Papaver) plant and another showing how opium is made from the sap of just one type of poppy, Papaver Somniferum, outside the museum’s introductory movie. At this stage my boys were about as interested as they would be if I were telling them about how I choose and grow different plants in our garden in Seattle – as in bored to death. Joking about the airline-like “here are the emergency exits” sections in the movie helped lighten the mood. I tried to encourage interest as we moved from the floor-to-ceiling multimedia displays telling about poppy usage from ancient times through the middle ages to it’s widespread usage in the late 18th century to the next room, a mock-up of a London wharf and the hull of a clipper. I wasn’t having much success. Then, as the history lesson unfolded, when the story of England’s obsession with tea and trade between Great Britain and her colonies extended to include the Boston Tea Party and the American Revolution, both my boys were riveted. We had to go back a room to examine the illustrations showing trade triangles and the trade deficit with China. You’ll be bored if I list everything we saw through the rest of the 5,600 sq meters of exhibition space in this excellent museum. Briefly, we learned about opium manufacturing industry in India, the Opium Wars, the effects of opium addiction on China in terms of population, industry and society. There were mock-ups of opium dens and display cases showing opium-smoking paraphernalia including some beautiful pipes and headrests. At this point Murph was interested mostly in parent-play-along mode. It was when we entered the sections on opium growing in the Golden Triangle and the options which are available to governments to manage and prevent widespread drug use where the museum came into it’s own for him. Information about drug law enforcement and crop eradication was presented beside options to manage drugs through legalization – with equal weight given to all methods. The museum display ends with two short movies: one telling the story of an English girl who died from a narcotics overdose in 2001 and one telling the story of a Thai local, a young father, who survived his addiction. 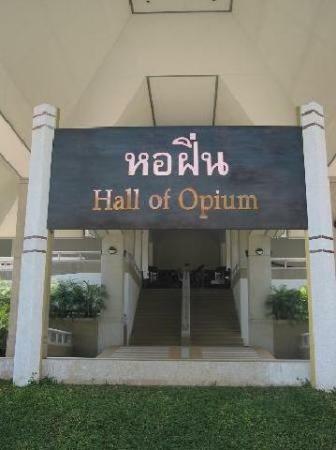 I wish that the Mae Fah Luang Foundation, who runs the Hall of Opium had a traveling version of this museum which they could exhibit to middle-schoolers and high-schoolers all over the world. 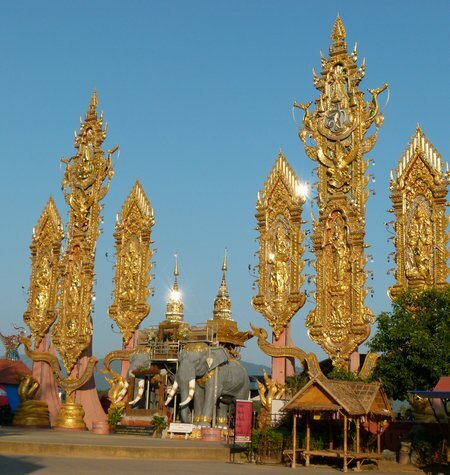 This entry was posted in International Escapades, Thailand and tagged Golden Triangle Drugs, Golden Triangle Southeast Asia, Laos, Thailand on February 8, 2011 by wandermom.